This thread is simple! Rather than having a million little threads about everything that goes on at Kolmården, this thread is designed to consolidate it all into one user-friendly thread. Feel free to use it to post updates, trip reports, questions, comments, and of course, general discussion. For pictures and videos of the park as well as past updates, see TPR's Park Index Kolmården. 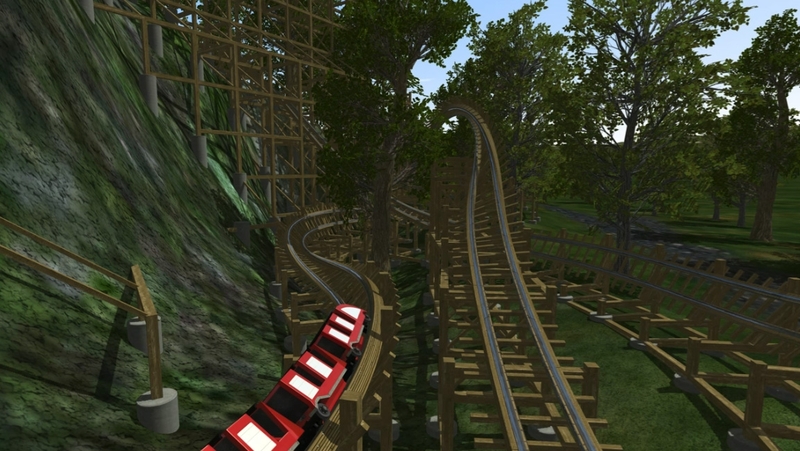 Kolmarden Announces "Wildfire" - The world's BEST wooden roller coaster! 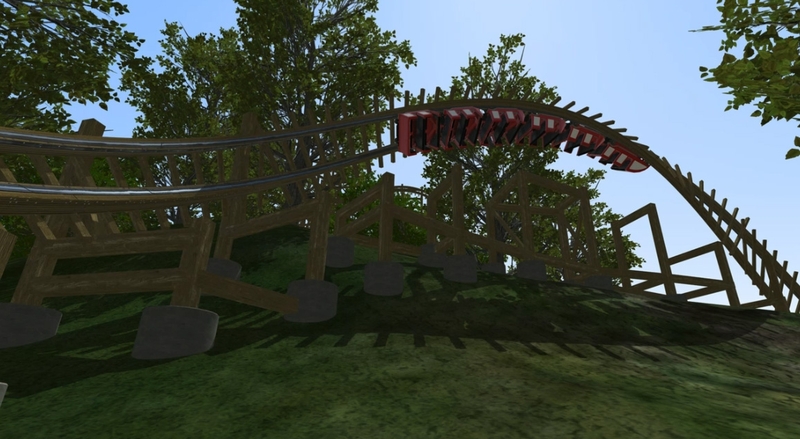 Europe's FIRST Rocky Mountain Construction wooden roller coaster! NOTE! This POV video is for layout purposes only! A new, better POV video will be provided by the park soon! 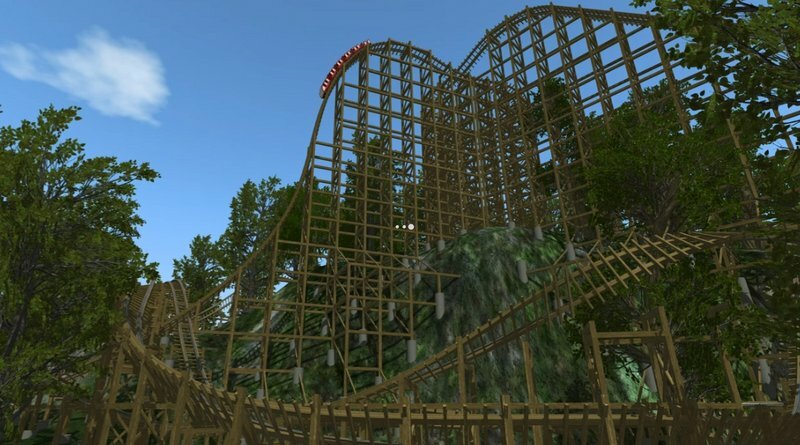 This summer, work will begin on Wildfire, the world's best wooden roller coaster. Thanks to new technology Wildfire’s pushing the limits of what was previously possible. 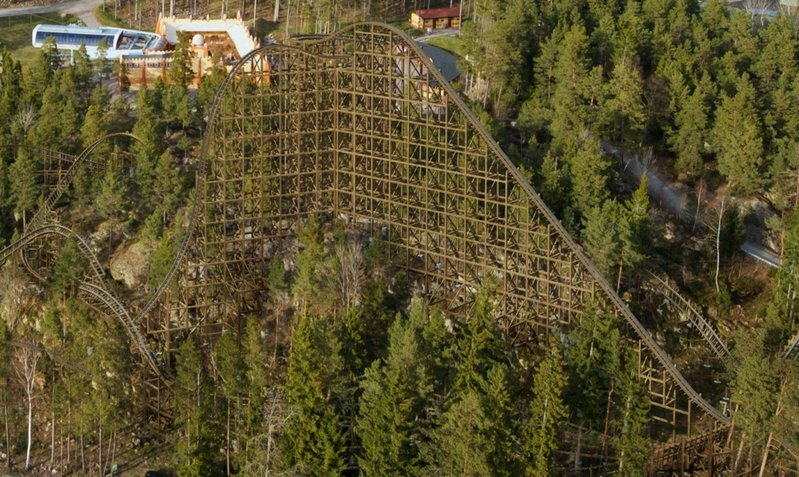 Once it is officially opened in the spring of 2016, it will be Scandinavia's fastest and tallest roller coaster and the fastest wooden roller coaster in Europe. The investment totals SEK 110 m.
At the top of the first climb, you are 132 metres above the blue waters of Bråviken bay, with a fantastic view over Kolmården's beautiful scenery. At the crest, the view suddenly gives way as you plunge 49 metres down toward the bottom of the ravine at an 83-degree angle in free fall. Your speed will pass 110 km/h as you approach the start of the next ascent and enter an 'Inverted Zero G Stall'. You are weightless! The train speeds onwards through the woods along the 1.3 kilometre track. Wildfire races between the treetops and the sensation that the laws of physics are being broken continues right up to the end. "For a long time, our goal has been to build the world's best roller coaster at Kolmården. The challenge has been to develop a world class roller coaster that blends in with the extraordinary landscape and the park's atmosphere. This has finally been made possible thanks to modern technology. We are delighted that this dream can finally be realised," says Johan Tidstrand, principal owner of Parks and Resorts. 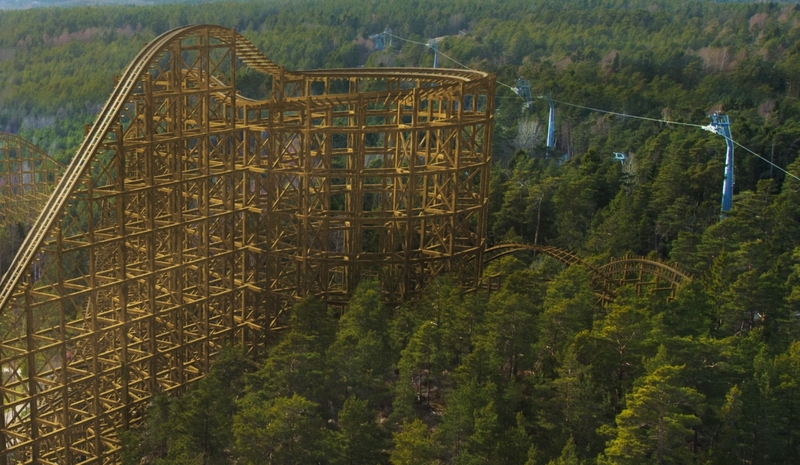 Wildfire, which will open at Kolmården in the spring of 2016, belongs to the new generation of wooden roller coasters. The ride is being built using new, patented technology that is revolutionising and pushing the boundaries for wooden coasters. The first roller coaster to use the new technology was built in 2013 at the Silver Dollar City theme park. 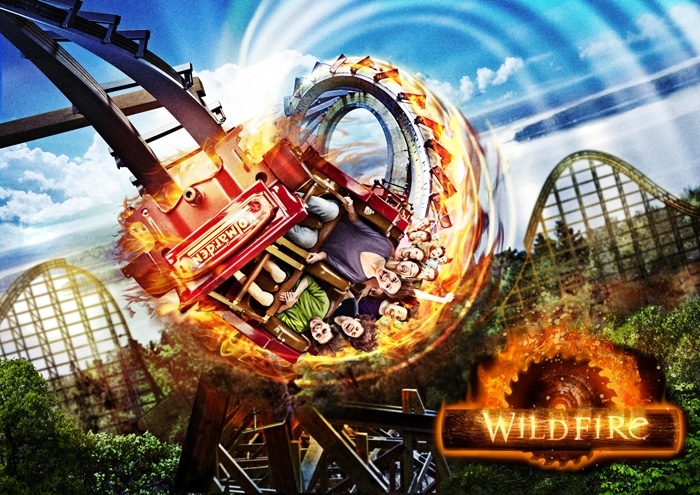 Wildfire will be the first roller coaster of its type outside the USA. 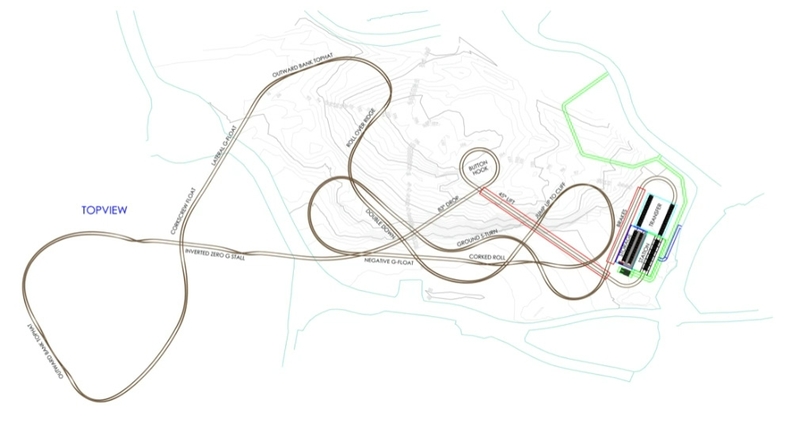 The result is a 57 metre high, 1.3 kilometre long track with a maximum speed of 113 km/h, three inversions and 12 airtime hills (4 with negative G). Wildfire will also be quieter than wooden roller coasters in general. "We have taken some of the best elements of the world's best roller coasters, added new ideas and created a unique ride. The result is Wildfire, a ride with so much air time, action and intensity that it has no equal. 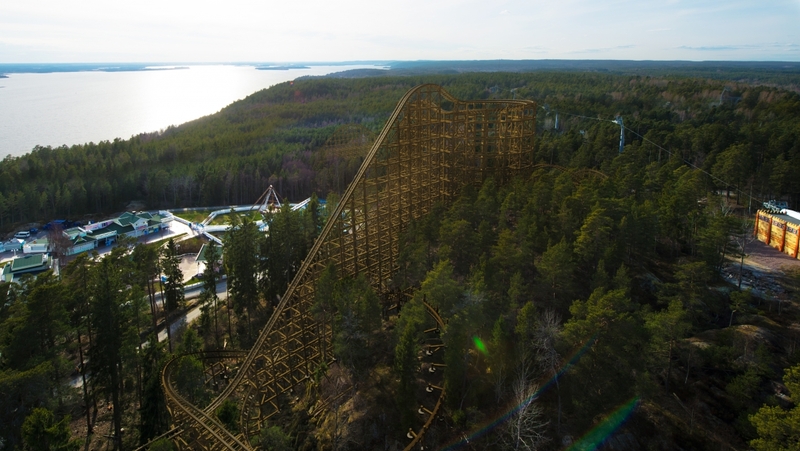 The two-minute ride through Kolmården's dramatic terrain high above the waters of Bråviken bay, will make it the world's best wooden coaster," says Peter Osbeck, Ride Manager at Parks and Resorts. 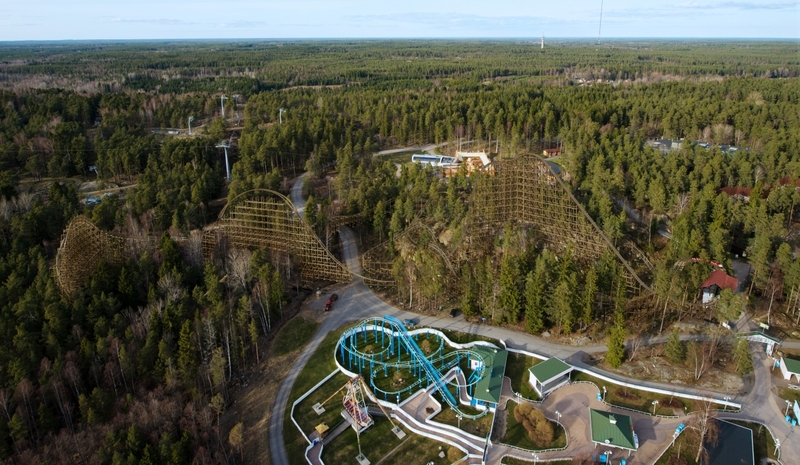 The investment in the new attraction amounts to SEK 110 million. 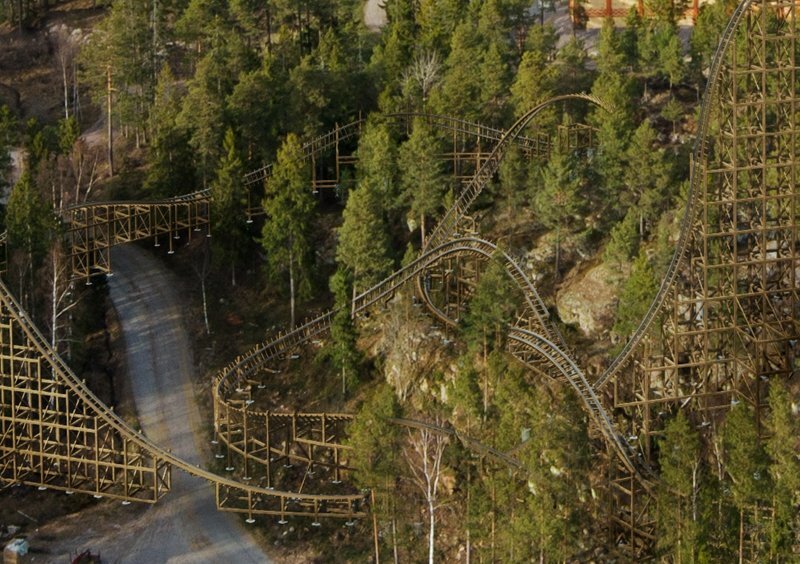 Wildfire is being built using Swedish lumber. "Wildfire, along with the other investments at the park, is being built in order to develop Kolmården as one of Sweden's top destinations. By continuously expanding the park, Kolmården will become an even better destination and we can attract more visitors. This will enable us to reach out to more people with our public education initiatives," says Mats Olsson, CEO at Kolmården. The name Wildfire has a strong link to the natural and cultural history of the area. Wildfires helped to shape the landscape and have been critical to the unique biodiversity that has been preserved in the area until this day. Wildfire is built by Rocky Mountain Construction. They will build the entire attraction including the trains. The track and trains are both their own patented designs. The trains for Wildfire will be custom designed. Vekoma, Rocky Mountain Construction’s European agent, is responsible for the power and control systems. The track design and layout is made by Alan Schilke, one of the world's best coaster engineer. Wildfire will open in 2016. Last edited by larrygator on Sat Nov 19, 2016 9:52 pm. Nice! The next couple years are already shaping up to be big years for the amusement industry. Did they tell you anything about when the details will be released? A week? a year? Well, at least we know where it's going. Hopefully I will have made enough money in 2015 to go on a TPR Scandi Tour in 2016! Super-exciting! Ap0ptosis wrote: Did they tell you anything about when the details will be released? A week? a year? Then all will be known on the 8:th of April, so just a couple of weeks to go. Kolmården is really shaping up to be a kick A$$ family park with this pace. They already have a massive "Bamse" themed area going in for next year. I will tell you that this is the kind of project that we would "drop any plans we had and make a trip for." No question. Wow, this seems like a very interesting and revolutionary project. That dive into the ground at :35 has my mind going crazy with ideas. I can't wait to hear the plans; as impressed as Robb seems this has to be one absolutely amazing project! I'm still not sure I believe this is actually happening! It's that amazing. When they told me their plans I was all "Wait, what? No. You're joking. This cannot possibly be real..."